Well, the Sugar Pop Quilt is finally finished. I had time to sew the binding on over the holidays and good timing too! This quilt is a homage to the original inspiration for my new fabric collection Pop Rox, with Andover Fabrics. And I JUST received the first yard of Pop Rox production! Sneak preview of that with the next posting! Just how is it inspiration? Don’t laugh. Every year I do extensive color trend research for one to two years out and build palettes to work from, at least as a starting point. When I actually build the palettes in Adobe Illustrator, they look like little horizontal lines with squares of colors. After I group colors together, I always arrange them in an order that makes sense to me. And lo and behold, after a day of making palettes, I woke up with this image of a palette repeated vertically in the colors of this quilt, against a light milk chocolate background. I have no idea why! Then I sort of said to myself, hmmm, what else can be done with these “wands” and I pictured them in all sorts of different sequences and added circles. With a big magic marker over then next week I sketched out about forty different concepts. Then eventually I started to build the ones I liked best into designs in Illustrator, and then created several colorways. There are about thirteen designs in the collection and six of them we put into the fabric collection with 2 colorways. One is in this colorway but against a white background, and another is in handsome neutrals, brown and blacks. Can’t wait to show them to you! In the meantime, here is the “Sugar Pop Quilt”. It is my third quilt, and the second quilt that I quilted myself. 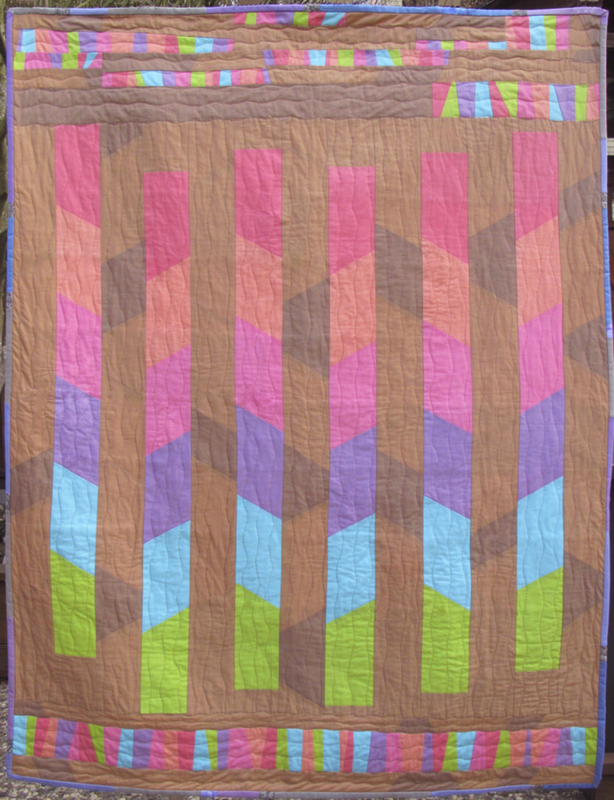 It was a mixture of a quilt design from a sketch and improvisational quilting for the top and bottom bits. I was going to try to free motion quilt it, but two things: I didn’t want to ruin it since I am such a beginner, and when I decided to do the vertical curvy lines, a walking foot seemed to fit the process best. 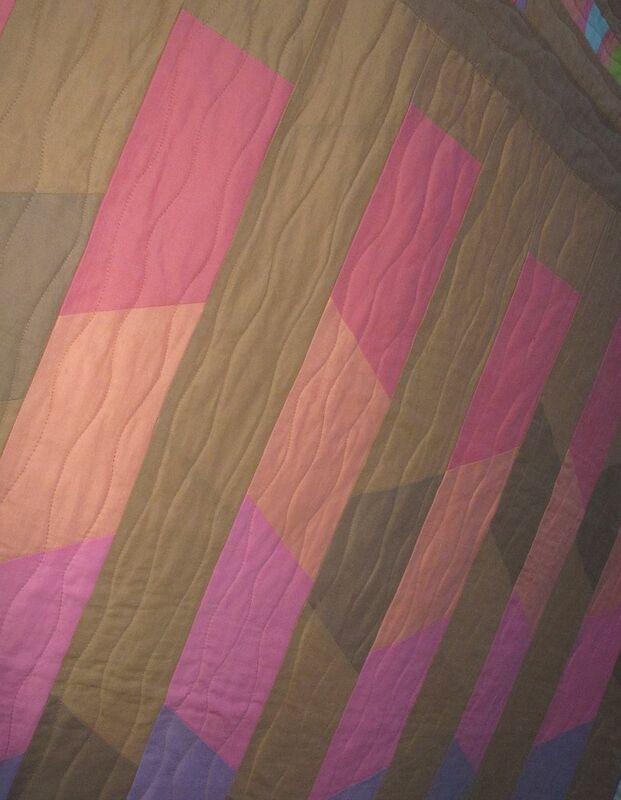 I know when I get to be a better quilter and sewer I will cringe that I posted my beginning quilts, but I live to laugh and someone has to share what it is like to start to quilt–with all the imperfections! Here is the quilt back. I did originally make a different one, but several people suggested it should be its own quilt, and when I realized that the quilting pattern I wanted to do for the front design wouldn’t look very good on that back, I decided to make a new one. Indeed, I have saved the original one to be its own quilt top. I put this together one Sunday afternoon and thought it fun to really capitalize on the pink/brown color combos. It’s simple but sweet. The old back is more greys, greens and blues. And may I add, Best wishes for a Fantastic 2014 to you all! This entry was posted in design, fabric design, Modern Quilting, Quilting, sewing, Uncategorized and tagged Pop Rox by Plaid Portico. Bookmark the permalink. Congrats, Carol! It’s fantastic. We’ll done! Thanks Wendy! I had fun with this one.